Low Carb Quick Paneer Tikka is spiced paneer, pan-fried quickly in ghee for a savory, Indian snack. This Low Carb Quick Paneer Tikka makes either a handy appetizer on its own or a welcome addition to other sauces and dips. 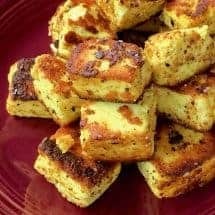 When I figured out how to make Paneer in an Instant Pot without having to babysit the process, I started to think of quick and easy things I could do with the paneer. I provided several options on that post such as Palak Paneer, Paneer and peas recipe, leftover Butter Chicken Sauce, Butter Soy Curls sauce. using it in the Chicken Korma sauce, and for Paneer Biryani recipe, But here’s another quick version, based on the very popular Chicken Tikka Bites recipe. Place paneer into a bowl and add oil and all the spices. Gently mix everything, taking care to not break the paneer. I found this easiest to do with my hands. Allow this mixture to marinate for about 30 minutes. Heat a skillet, and when it's hot, add two tablespoons of ghee. Lay the paneer cubes in a single layer in the pan. Let it sear for 1-2 minutes, and then using tongs, turn the pieces to sear the other side. Once both sides are seared, you can reduce the heat a little to finish warming the paneer. Spritz the lemon juice right before serving. How to reduce salt..I used salted paneer and added more salt in marination..Any idea? Just don’t add salt in marinating if it bothers you.